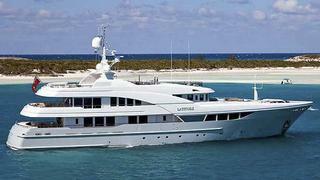 Yachtzoo tell me that, having been sold just last week, the 45m tri-deck superyacht Latitude is now back on the market. Designed by Vripack and built to DNV class and MCA compliant by Russia's Timmerman yard in 2009, Latitude has an interior by Bannenberg and Rowell accommodating up to 13 guests in five staterooms. Twin 720hp Caterpillar engines give her a cruising speed of 10 knots and a range of 4,000 nautical miles. Located in Monaco, Latitude is asking €14,950,000.